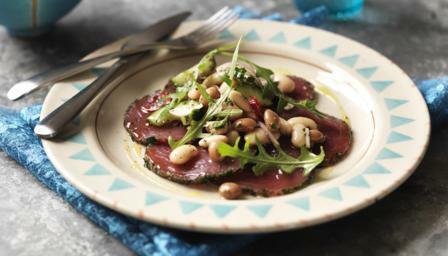 Thinly sliced marinated tuna makes a stunning, yet surprisingly easy starter, served with a mixed bean salad. Rub the tuna with the lime juice. Mix the herbs together and place onto a sheet of cling film on a flat surface. Place the tuna on top and roll in the herbs, to cover completely. Roll the cling film up tightly around the herb-coated tuna to form a tight cylinder, twisting the ends to seal. Place into the freezer for two hours. For the salad, place the cucumber into a frying pan and place over a low heat. Warm the cucumber until the excess water evaporates. Add the vinegar, sugar and chilli and bring to a simmer, then remove from the heat. Place the onion into a bowl and pour the cucumber mixture over the top. Stir well, then set aside to cool. When the cucumber and onion mixture is cool, add the beans and parsley and mix well to combine. Season, to taste, with salt and freshly ground black pepper. To serve, remove the tuna from the freezer. Using a sharp knife, slice the tuna very thinly and place onto a serving plate in a circle. Place some mizuna leaves into the centre (if using) and top with a spoonful of the cucumber and bean salad.